The Doha knowledge economy mandate means free and frequent access to global technical and entrepreneur leaders. A few weeks ago I attended an event Your Middle East Start-up and heard a compelling talk from Swedish Ambassador, Ewa Polano on how entrepreneurship means fostering innovation. 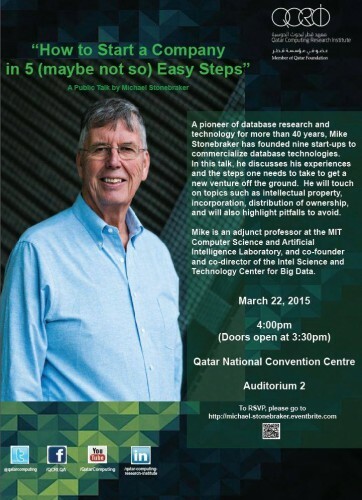 Well, this week, serial entrepreneur Michael Stonebraker will be at the Qatar National Convention Centre to talk about “How to Start a Company in Five (maybe not so) Easy Steps by Michael Stonebraker”. If you are a local Entrepreneur or curious, the team at Qatar Computing Research Institute would like to invite you to hear Mr. Stonebraker’s talk on Sunday, March 22, 2015. Register here for free. About Michael Stonebraker: A pioneer of database research and technology for more than 40 years, Mike Stonebraker has founded nine start-ups to commercialize database technologies. In this talk, he discusses his experiences and the steps one needs to take to get a new venture off the ground. He will touch on topics such as intellectual property, incorporation, distribution of ownership, and will also highlight pitfalls to avoid. Mike is an adjunct professor at the MIT Computer Science and Artificial Intelligence Laboratory, and co-founder and co-director of the Intel Science and Technology Center for Big Data. 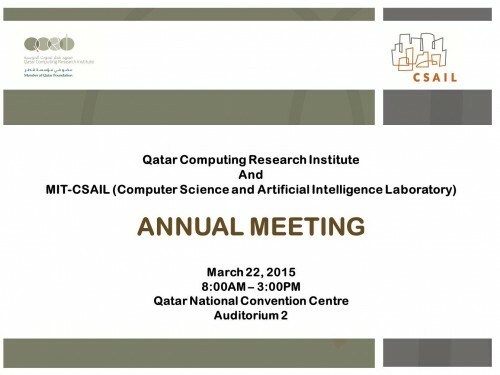 We invite you to join the annual research project review meeting by QCRI and MIT-CSAIL. On Sunday, March 22, 2015, we will dive into the current projects and progress. This special event provides more detailed look at technical innovations from this collaboration. One of the projects includes my Social Computing colleagues: Punya – a easy apps development platform for humanitarians. Both events are at the Qatar National Convention Center. See you there! The Random Hacks of Kindness at International Conference of Crisis Mappers took place this past weekend (October 13 – 14, 2012) at George Washington University in Washington, DC. Humanitarian hackathons are specialized in that the hacks proposed are brought by subject matter experts who fully understand the needs and impact of a tool built out during the event. While not all events curate their challenges, we did at this one, with the esteemed team comprised of The Doctor, Robbie Mackay, Jen Ziemke, Heather Leson, Kate Chapman and Willow Bl00. They examined each of the 16 proposed challenges for usefulness, if it could be accomplished over the weekend, technical specs and feasibility, as well as strong use case. Our 40 participants piled into our tiny room to work on the 7 of selected challenges. 5 presented on Sunday afternoon. Many thanks to our sponsors AT&T Developer Program and John Carroll University. Thanks to you, we had essential coffee, delicious food, candy and steady internet tubes. We were also able to award prizes to each of the teams. 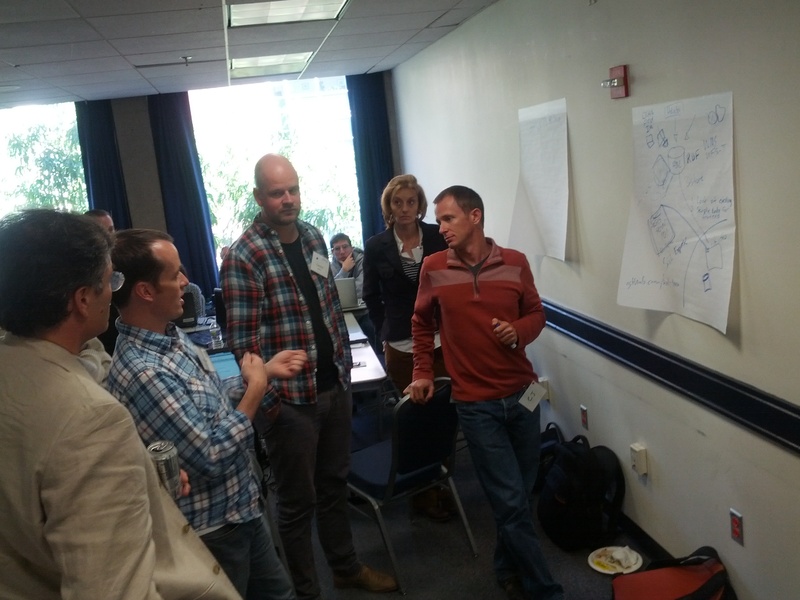 James with Amnesty International worked on Challenge #8: Geographic Web Data Curation Tool with Nico from InSTEDD. This collaboration made me happy for two main reasons – one was that they were able to address James’s challenge with an existing tool. The second reason is that James, who came with little coding experience, took the weekend to learn about RIff and apply it to his problem space. There is a distinct issue in the digital humanitarian community of “Wasn’t Built Here” which adds to the already massive cognitive load of the responders.Extending an existing tool means we can keep using what works while making it better. Clay and Jorge (Challenge #13: Mapping United Nations Security Council Resolutions) implemented MapBox by porting in UN Policies and geocoding them to the areas they were based around, matching a geospatial and temporal interface to search the resolutions issued by the United Nations Security Council. A quick way to see where the UN had been focusing, along with an easy pull on the referenced documents, this creates another way for people to search and catalog. The Taarifa team linked up to a group in England to create the hardware trigger for a data snapshot from just about any input, along with the API call which would link up to that snapshot. A continuing hack from H4D2 (and other hackathons), we were pleased as punch to see this group working hard to see their platform for civic reporting push forward and build out their contributing community. A subtle but powerful glue was created by Josh Snider while working on Challenge 15: Extracting info into SMS reports. A user could send in a text which would port directly into a wiki and geocode. If formatted incorrectly, a text is returned to the person asking them to reformat. The potential of messaging format issues could assist in the accuracy of content collected to so support digital humanitarians in processing massive amounts of incoming texts into maps. Best overall hack went to the Humanitarian Markup Language (HXL) team, a challenge brought to the table by UN OCHA’s CJ Hendrix. It furthered the capabilities of this platform by doing creating an easy way to interact with maps, with special care payed to the visualization and interface – be still my linux-loving-mac-using heart. It eases the process of grabbing maps, uploading maps, and plugging them into what you need.Huge thanks again to our sponsors, and to the ICCM team Jen and Patrick for organizing the event our hackathon went hand-in-hand with. A special sparkle kittens to Heather Leson of Ushahidi for co-organizing and facilitating the event. I’ll match my blue hair to your pink hair anytime. 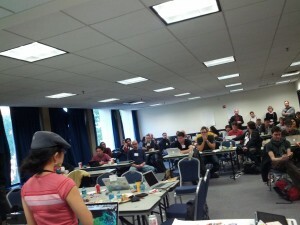 RHOK and ICCM share common goals of uniting the brightest minds for sprints of collaboration. This was the first time that RHOK occurred at ICCM. It was amazing to have guest subject matter experts join the hackathon to share their expertise with the talented developers and challenge owners. This is a huge opportunity to keep the momentum. A number of the challenges will continue on to RHOK Global in December. 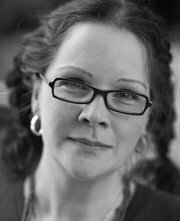 Willow and Heather will work with the folks to mentor their efforts. As well, based on the success of ICCM RHOK, we recommend that ICCM in Nairobi also have a simultaneous RHOK. The first Random Hacks of Kindness (RHOK) in collaboration with the International Conference of Crisis Mappers (ICCM) will be held on October 13 – 14, 2012. We will brain on curated hacks that focus on humanitarian and crisismapper needs. These challenges can be maps, data, tools, and hardware that pertain to the emerging technology needs of Crisismappers. Challenges may be tool or organization specific, but the RHOK goal of open source solutions or prototypes remains. 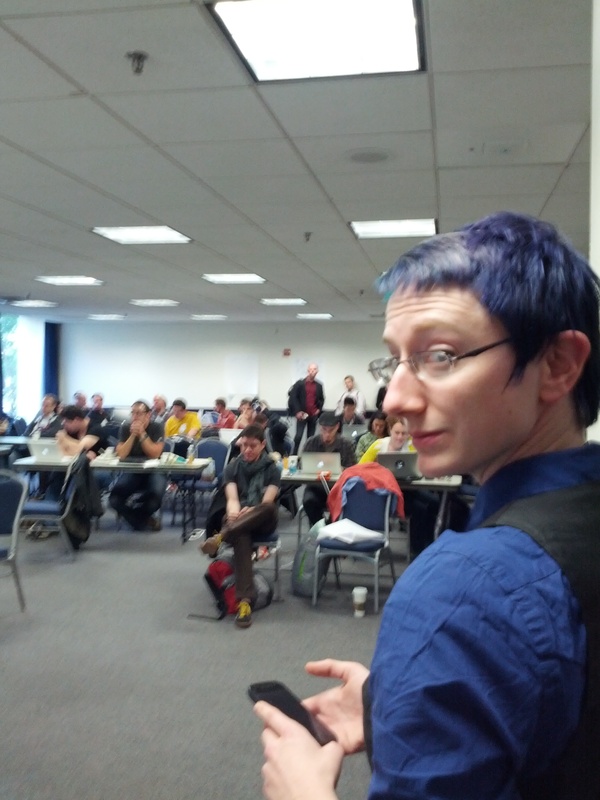 This event provides a unique convergence of mappers, developers, humanitarians, NGOs, and governments in the same space. We truly cannot wait to make stuff and help merge dialogue with action. We’re delighted to have challenges from UN OCHA, MIT and Taarifa. More to come! Every effort will be made to include virtual participants via Google Hangout, Skype and IRC. Please register and make a note of your virtual participation. We are accepting challenges until 19:00 EDT October 1, 2012. The International Conference of Crisis Mappers is the largest and most active international community of experts, practitioners, policymakers, technologists, researchers, journalists, scholars, hackers and skilled volunteers engaged at the intersection between humanitarian crises, technology, crowd-sourcing, and crisis mapping. As you all know, Random Hacks of Kindness is an event and community that brings together similar minds for quick sprint-like “hacks” aimed at prototyping solutions for real world problems. The event will be held on October 13 -14, 2012 at George Washington University. 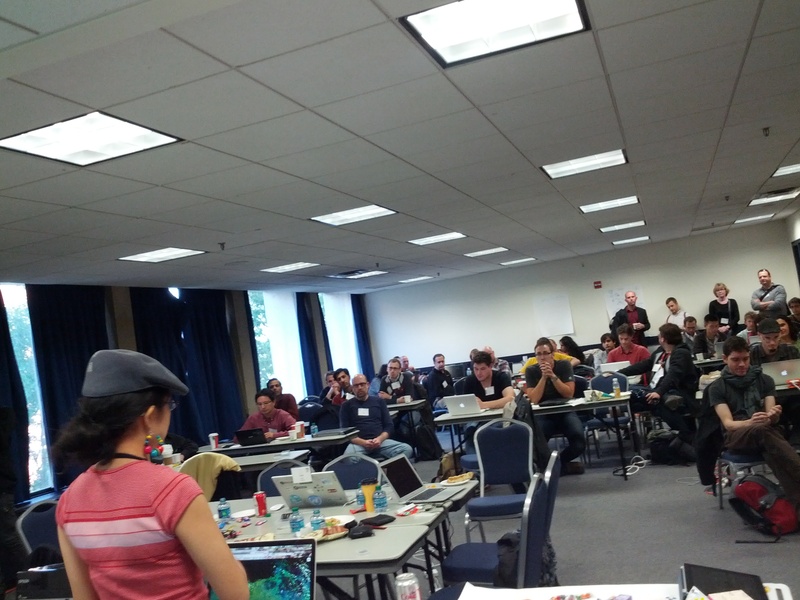 The goal of RHOK ICCM is to unite the hacking (technical communities) with the humanitarian communities. ICCM RHOK registration is separate from the main ICCM events. It is free and open for any participation. We are very thankful for our sponsor, the AT&T Developer Program, for making this possible.